Yes and no. Speed is not the focus here. Accuracy is what matters. 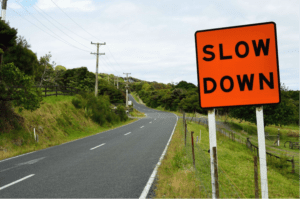 The key reason for slowing down is that when you write perfectly at speeds much lower than your current level, you will feel more confident about your writing. When you write perfectly at lower speeds, you will write better at higher speeds. For advanced level students, write at 50 to 100 wpm or more below your current speed for a minimum of 30 minutes, three times a week. Keep lowering the number of words per minute until you are able to write every word accurately the entire time, with perfect punctuation. Don’t move up to a higher speed until you achieve perfection. No drops. No shadows. No finger-drags. Zero errors. Close your eyes to eliminate distractions and FEEL your fingers reaching for each key as you listen to dictation or an audio file. Stay focused on every stroke. Listen carefully for the small words that may easily get missed – to, the, in, on, and, at, or, of, for, nor, from, that, this, their, they’re and there, etc. Writing at slower speeds may feel strange at first, but do it anyway, even if teachers or other students wonder why you are sitting in lower level dictation classes. If they ask, smile and tell them that you are perfecting your writing. Golden Rule #4: Slow Down to Speed Up is an excerpt from Part 2 of my e-book, 0-225: Your Guide to Writing Mastery (October 2015).